Abdul El-Sayed and Alexandria Ocasio-Cortez will be at the Ottawa Hills High School Auditorium for a rally on Saturday. GRAND RAPIDS, Mich. - On July 28 and 29, Alexandria Ocasio-Cortez is joining Democratic gubernatorial candidate Dr. Abdul El-Sayed for several campaign stops across Michigan. The trip includes campaign stops statewide, including Grand Rapids, Flint, Detroit and Ypsilanti. The campaign will be rallying on key progressive issues related to clean water for Flint and immigration reform. The trip comes after El-Sayed was endorsed by Sen. Bernie Sanders on Wednesday evening. Crowd at Ottawa Hills High School Auditorium for an Abdul El-Sayed rally. 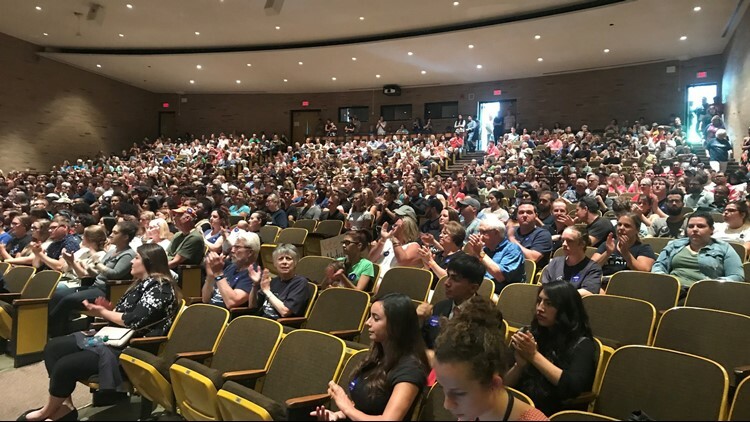 On Saturday, El-Sayed and Ocasio-Cortez were at the Ottawa Hills High School Auditorium located on Rosewood Avenue. In a historic upset in June, Ocasio-Cortez won the Democratic primary for New York’s 14th Congressional District, unseating a 20-year incumbent. If she wins the general election in his district, Ocasio-Cortez, 28, will be the youngest member of the United States House of Representatives. El-Sayed is running for governor to make state government work for all Michiganders. He is Detroit's health commissioner and as governor. El-Sayed wants to address raising minimum wage, passing Medicare for all and making college affordable for families who make less than $150,000 a year.